Image Size: 22.625 X 25.5 in. 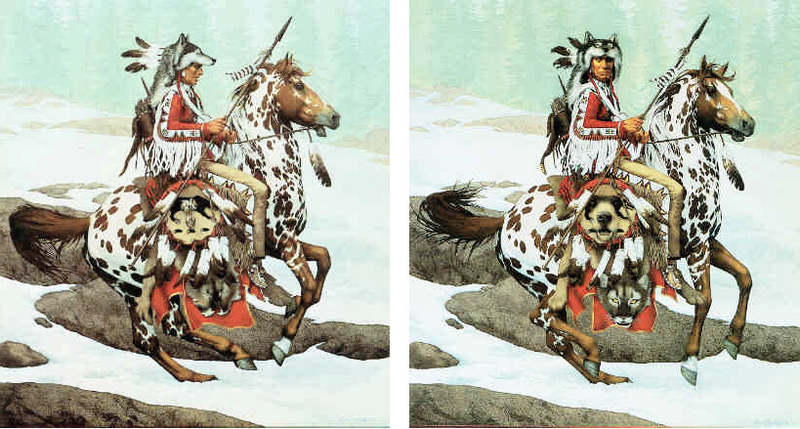 A Blackfoot Indain rides forth in full dress adorned with the feathers, pelts and claws of his animal protectors. Next we see him in the moment he has become aware of danger, warned by the spirit of the wolf he wears as headdress. Fearless as the mountain lion whose pelt he uses as a riding cloth, he turns his face toward us and we see ferocity and cunning, wisdom and strength come alive to ride with him. There are eighteen spirit animals watching over this warrior.